What is the reason behind Turkey’s change of approach towards Kobani in allowing aids to reach this region from Iraq’s Kurdistan province? It seems that the pressure of the public opinion of the region, the protests inside Turkey, the insistence of the US and its western and Arab allies which have formed a coalition against ISIS, the growing number of refugees from Kobani in Turkey, threats against the peace process with the Kurds, particularly the PKK, were effective in this change of approach. What is your view about the analysis about Turkey which says that Turkey is faced with two situations; it either has to ignore the Iraqi Kurds and be indifferent towards the influence of ISIS and allow it to continue its activities, or permit these two Kurdish parties which are considered as the political and ideological continuation of the Turkish Kurds led by Abdullah Ocalan to begin their activities? Preparing the ground for the entrance of the Peshmergas of Iraq’s Kurdistan province to Kobani is significant because Erdogan and the government of Turkey have good relations with Barzani and, in fact, trust them and are not concerned about the impacts of the Kurds of Iraq’s Kurdistan province on Turkey’s Kurds. But Turkey is concerned about the unity of the Kurds of Turkey and Syria who are affiliated with the PKK in particular with regard to the autonomy of the Syrian Kurds which could move on to Turkey as well. What has been the impact of the issue of the failure of the democratic unity in Ein-ul-Arab or Kobani, which is considered as the end of the autonomy plan of the Kurds, on Turkey’s positions? Turkey, particularly Erdogan, need Iraq’s Kurdistan province from a geopolitical point of view, the issue of the Kurds, energy and playing a balanced role with Baghdad, Tehran and Damascus and regional issues. Therefore, there is no possibility that Turkey would ignore Iraq’s Kurds. Would it be correct to say that the presence of the Peshmerga forces who are Erdogan’s allies in Erbil who are the arch enemies of Ocalan and are loyal to Masoud Barzani, along with military forces which oppose Syria and have been trained during the past three years by Turkey is Erdogan’s poisonous gift to Kobani and Turkish Kurds? Ankara cannot be indifferent with regard to ISIS and it is concerned about the terrorist operations inside Turkey. This indifference is not possible due to the pressures that are exerted by the US and inside Turkey. Thus, the term poisonous gift cannot be considered here. Turkey’s problem is that it has placed itself in a paradoxical position; on one hand, it has played a role in the creation of ISIS aimed at overthrowing Bashar Assad and, on the other hand, it is faced with the problem of their presence near its borders. This is while ISIS should have played a greater role in the border between Syria and Iraq. The crisis of the Kurds who live inside Turkey, their relations with the Syrian Kurds, their possible unity in the future, concerns about ISIS, the pressures of the western and Arab states have placed Turkey in a difficult position. Furthermore, although the failure of the democratic unity and autonomy in the Kurdish-inhabited regions of Syria could reduce Turkey’s concerns, it will not remove the Kurdish crisis in Syria and Turkey. The Kurds will demand their share of power in the future of Syria. This crisis will not be resolved by the physical elimination of parts of the Syrian Kurds by ISIS which Turkey had pursued. We saw that this solution did not last and Erdogan issued permits for the entrance of the Peshmergas of Iraq’s Kurdistan province to Kobani. It seems impossible that the Kurd Peshmergas of Iraq who are friends of Erdogan would be poisonous for the Kurds of Syria and Turkey. Nonetheless, they are both Kurds. 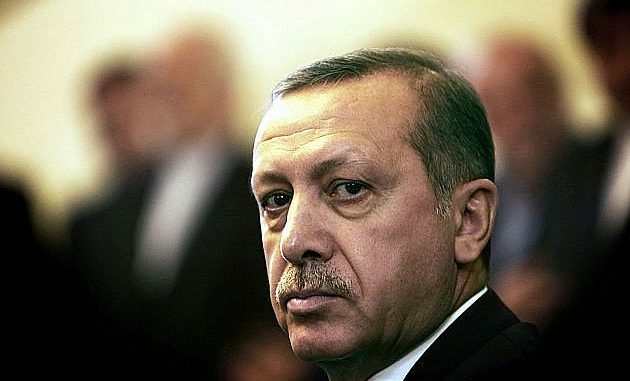 Turkey’s game in Syria would be an Achilles’ heel for Erdogan who is the President of Turkey now. By increasing the tensions and challenges inside and outside of Turkey and its growing expenses, Erdogan is putting obstacles in the path of his political and economic plans.